When I was I kid, I was taught the name ROY G BIV as a way to remember the order of colors in a rainbow: red, orange, yellow, green, blue, indigo, and violet. My garden is showing the complete spectrum of colors this month, but I would have to say it represents something more like ROYYYYYY G BIV, for all the yellow flowers it contains. 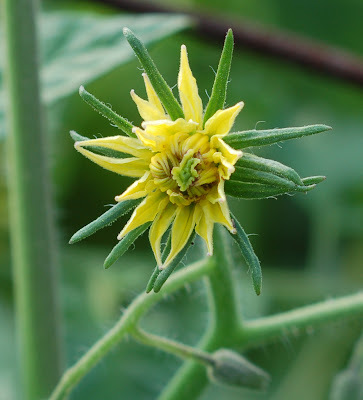 Why do so many edible crops have yellow flowers? I wonder. 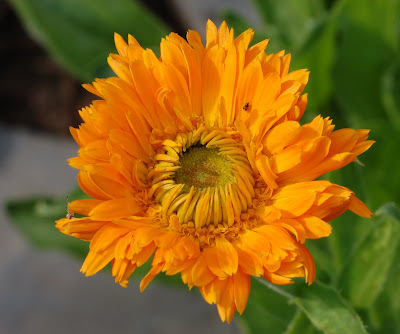 With so much blooming in the garden right now, I had to give myself a jump start on this month's edition of Garden Bloggers' Bloom Day; I started my photography for this post three days ago. It's a good thing I did, too, because the weather has been a real challenge lately. In each of the past two days, I started taking photos out at the plot and then had to run back to the apartment in advance of severe thunderstorms. Standing in an open space holding a metal tripod is not exactly where I want to be when the lighting starts crackling on the horizon. But I managed, over the course of these past couple days, to steal a few sunny spots. And as the rumbling gray thunderclouds parted, there was my rainbow. 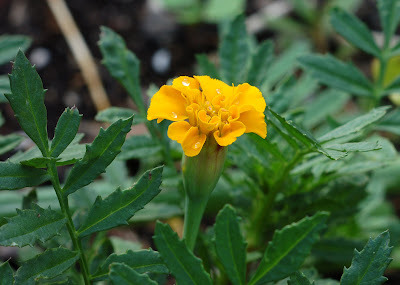 Curious about what's blooming in other gardens today? Visit May Dreams Gardens to find out who else is participating in Garden Bloggers' Bloom Day. Bloom Day, May, April & March. I wish I had been interrupted by a few thunderstorms here where I am. I just had to contend with the sun. All your flowers look wonderful, especially knowing what they will bring you later to eat. Thanks for participating in Garden Bloggers' Bloom Day again! WHat a beautiful selection of blooms - there's something special about yellow flowers at this time of year that makes one's heart sing. 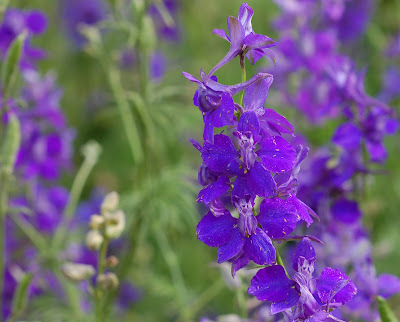 And then there are the blue/purple flowers which complement the yellow blooms to perfection. 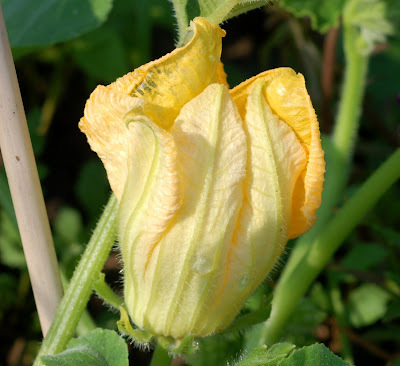 Great post, I recently commented on the fact that vegetable flowers are often overlooked and not enjoyed for the ornamental qualities that they display. 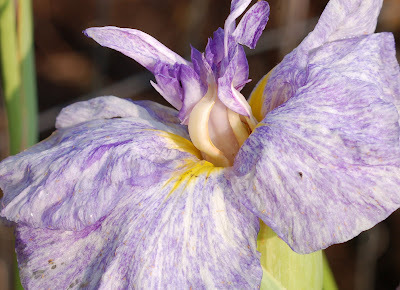 Your photos show just how amazing even the simplest of blossoms can be! I love that pepper picture although all are wonderful. Thanks for sharing. 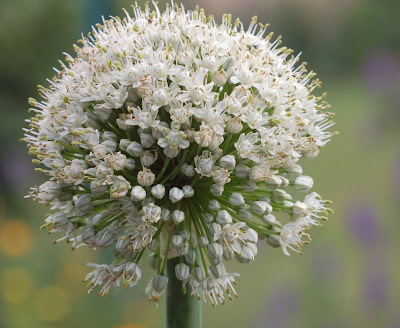 Great post, good flower photo's I really like the Onion flower shot with the background of blue flowers out of focus. What kind of camera do you use to take these nice pics? 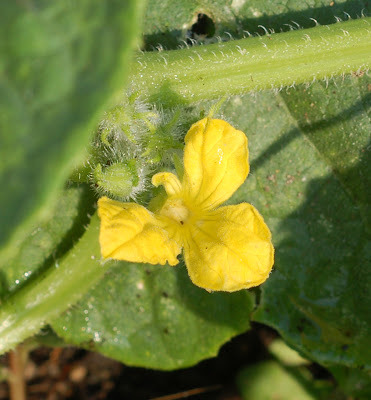 It is interesting that so many vegetables have yellow flowers. 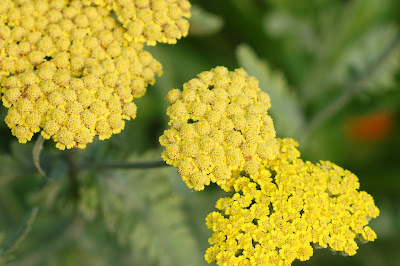 I wonder if there is a general preponderence of yellow flowers in nature? 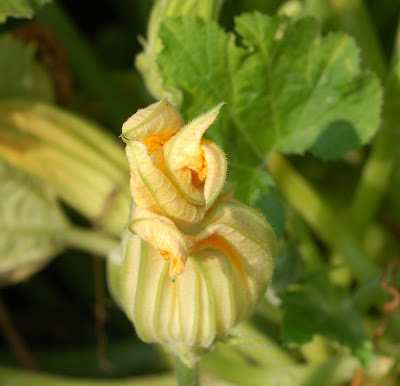 Thanks once again for reminding us to appreciate the flowers on our edible plants. We too have had rain rain rain for many days, and it started with a huge thunderstorm middle of last week. 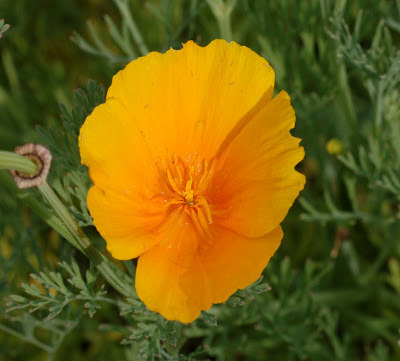 I love California poppies, mine aren't blooming just yet. Maybe still a bit too cool here. Mary, I enjoyed learning about the saying you use in England to remember the rainbow colors. It's much more intersting than our Roy G. Biv! Curtis, I use a Nikon D50 for all my photos. And a macro lens + tripod for the onion pic. Hi Christa - I have to tell you that I laughed out loud at ROYYYYYYY G BIV. Your flowers are beautiful. Thanks for visiting my blog. 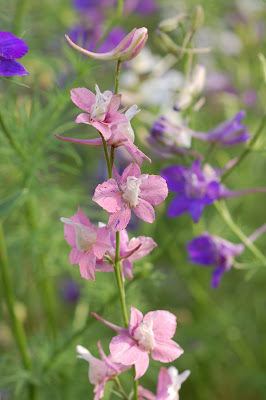 Great blooms - I love the larkspur! Hm, which pic is my favorite? That is a tough call. 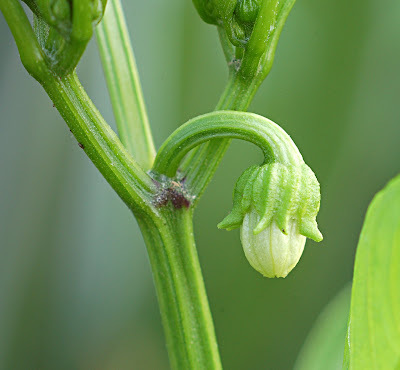 I think it may be the pepper blossom for its sheer, elegant simplicity. Lovely. I loved all the pictures. I will have to check out the Blogger's Bloom Day. Thanks for the link. Thanks for posting about this, Christa, and with such lovely pictures. 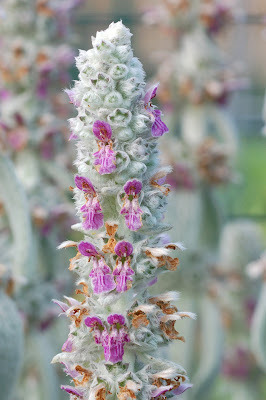 I was really pleased to find out and post some pix of my own garden in bloom. Hi Christa – what fantastic photos of your blooms, beautifully grown and perfectly captured on film. Congrats – I wasn’t as well prepared as you and had to delay my post as I couldn’t take my camera outside in the rain and winds of Scotland! 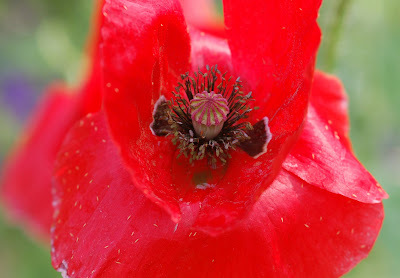 My photos are finally up today – you will find them at shirls gardenwatch. Just lovely! I do love the ornamental aspects of my vegetables. 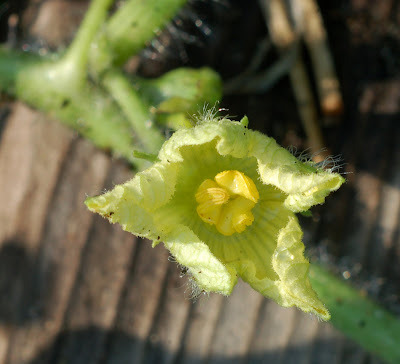 I just don't happen to have any squash blossoms just yet. Thankyou for the tour!